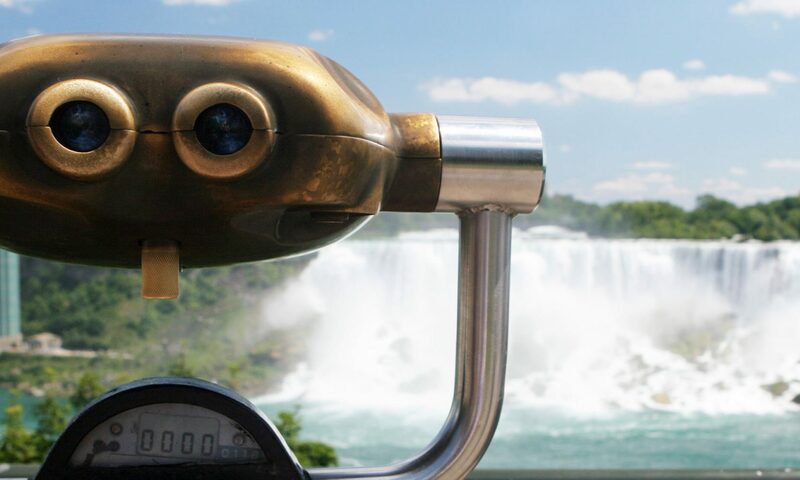 Since 1535, the beauty of Niagara Falls was recorded by explorers to the New World. During the early 1700’s, the British and the French battled each other for control of this area. By 1760, the British had forced the French to retreat from Niagara. In 1779, French philanthropist, the Duc de la Rochefouchauld, while visiting Colonel John Graves Simcoe and his wife Elizabeth, was the first visitor to realize that trade and development could do more damage to the beauty of the Falls than any war possibly could. He wrote a proposal that the government take over and preserve the Falls. Rochefouchauld also saw the importance of vantage points from which to view the beauty of the Falls. The British realized the importance of preserving the land along the banks of the entire Niagara River as a military reserve. This allowed the British to command the many strategic areas overlooking the Niagara River below. In 1786, the British Government commissioned surveyor Augustus Jones to create a military reserve on behalf of the British Government along the length of the gorge and the river. This reserve would be the width of a chain length, 20 metres, (the standard measurement at that time). In 1852, ownership and jurisdiction of the military chain reserve was turned over to the Government of Upper Canada from the British Government. In 1856, Frederic Church, an American landscape artist came to Niagara Falls. In order to preserve the natural beauty of the Falls along both sides of the border and to prevent unwelcome commercialization, Church began a campaign to establish public parks along each side of the Canadian and American borders at Niagara Falls. In 1869, Frederic Church met a strong supporter of his public parks proposal in Frederick Law Olmstead, an American landscape architect. The articulate and well spoken Olmstead lobbied many politicians in the Western New York area of the Niagara frontier. Olmstead made a similar appeal to Canadian Governor – General , Lord Dufferin. In 1878, during a speech, Lord Dufferin publicly announced his support for a public park at Niagara Falls. Lord Dufferin along with the Premier of Ontario, Oliver Mowat lobbied Governor Robinson of New York State to support the public parks proposal. In January of 1879, Governor Robinson recommended Lord Dufferin’s public parks proposal to the New York State Legislature. By September of 1879, the New York state geological survey report had been concluded and the results shared with the Ontario Government. The report suggested land acquisitions should be carried out by both governments. The Ontario Government supported the report but suggested that the Dominion of Canada should assume the cost of establishing the park since it was claiming jurisdiction over the lands involved. This financial dispute delayed the development of the Canadian public park at Niagara Falls for three and a half years. In February of 1880, Premier Mowat introduced a law entitled "An Act Respecting Niagara Falls and adjacent Territory". The ownership of the chain reserve was still an issue yet to be determined. Mowat thought his law would force the Federal government into action. The Government of Canada responded by creating a Federal Niagara Parks Commission but no action to develop a national park was undertaken. The Americans acted unilaterally in the development of the New York Reservation State Park at Niagara Falls. The park became a reality on April 30th 1885 when it was signed into law by Governor Hill. The new Reservation State Park would consist of 412 acres including Prospect Park, Goat Island and Bath Island. The cost to create this park was estimated at approximately $1.4 million dollars. The New York Reservation State Park was officially opened to the public on July 15th 1885. In 1883, the new Governor – General of Canada, the Marquis of Lorne, resurrected the development of a public park. In 1883, the Canadian Southern Railroad wanted to build a bridge across the Niagara Gorge near the Falls. This proposal spurned Premier Mowat of the Province of Ontario into action to protect the landscape near along the Niagara River. On March 20th 1885, Premier Mowat introduced the "Niagara Falls Park Act – an Act for the Preservation of the Natural Scenery about Niagara Falls". It was passed into law on March 30th 1885. Casimir Gzowski became the first chairman of the Niagara Falls Park Commission. Other founding members included John Langmuir and John G. MacDonald. The original park was comprised of 154 acres which included the area between present day Clifton Hill and Cynthia Islands (presently known as Dufferin Islands). The width of the park was extended beyond the original chain length to approximately 300 yards west from the Niagara River to the glacial moraine which rises approximately 100 feet above the plain. Nineteen private properties were expropriated and the cost of parks creation was estimated at $436,813.24. On April 23rd 1887, "the Queen Victoria Niagara Parks Act" was passed by the Government of the Province of Ontario. The recommendations by the founding Commission were adopted. The first Park Superintendent was James Wilson. The Queen Victoria Niagara Parks was officially opened to the public on Victoria Day – May 24th 1888.